Kitchen remodeling can be overwhelming so we’ve prepared a step-by-step guide to planning, designing and executing your remodel. General contractor- Manages 4 or more building trades and coordinates materials and schedules. Provides costs after receiving plans and specifications. Free estimates made prior to plans and specifications are calculated on entry baselines and structured to change as project development becomes known. Contract costs are not-fixed upfront and are cost-plus. Certified Designer (Kitchen, Bath, Interior)-Floor plan review and layout, Architecture review, product selection + coordination. Cost- Hourly rates for services or a percentage of overall renovation cost. Architect-Site plan review, Floor plan review, elevation review, plans for building and permits. Cost-Hourly rates for services or a percentage of overall renovation project. Structural Engineer-Load review and calculations. Cost-Hourly rate or flat rate per project. Design/Builder-Vertically integrated building + remodeling method that combines parts or all of the following: architecture, structural engineering, design and GC project management roles holistically. Provides all developmental planning, plans, specifications and project management. Free consultations are geared to understanding all costs associated within the targeted home renovation. Contract costs are fixed. Homeowner-Determines the job scope and job requirements. Identifies sector leaders to interview. *This is a question you ask somebody who you assume has no idea what something is going to cost and that’s true of homeowners wanting to remodel their kitchen. So the question, or more importantly the answer you give is merely letting the professional gauge how to educate you or where to steer you. Below is where your budget will generally take you. Preservation remodel/cosmetic- Replacement of dated components (Will not include cabinets). *This represents 85% of kitchen remodeling activity. Some Kitchens in this category are GC’d, most are homeowners directing a few specialty trades. Kitchen remodeling with cabinet modifications or new cabinets. Everything stays in the same locations- *Represents 11% of kitchen remodels. Includes a percentage of new cabinets or all new cabinetry, possibly strategic design elements, cabinet refinishing, some or all new appliances, counters, backsplashes, lighting, plumbing and flooring. Kitchens in this category may be GC’d if the homeowners are skilled enough to direct the design. Otherwise the remodel planning and specifications are led by an independent designer followed by the employ of a GC, or led holistically by a Design/Build remodeling company as a single source. Gut kitchen remodels- *These only represent 1 out every 25 kitchen remodels or 4% of the market. They target transformational design changes and many encompass erasing dated envelopes and involve a complete replat of the rooms relationship to other spaces. The mindset is “make-it-right, I’m not going anywhere”. Common denominators in these kitchen renovations involve the need to remodel connected rooms and address floors in multiple areas. 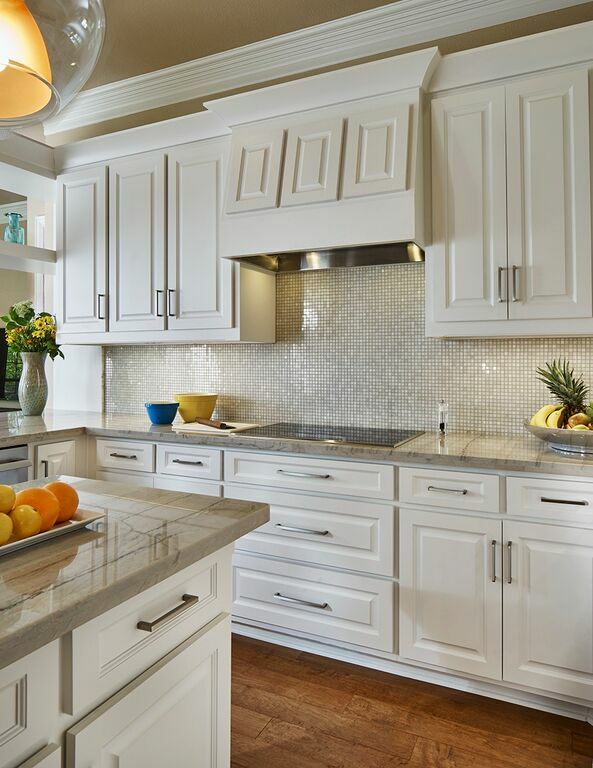 Kitchen renovations in this category should not be homeowner led as they require conceptual visions based on variables that require professional evaluation. Design teams are necessary, therefor plans are drawn by designers with all specifications of products noted, select GC’s are then employed to cost the project, or a Design/Build remodeling company is consulted for a turn-key approach. #3. So What Does it Cost? a 3-by-5-foot island; laminate countertops; and standard double- tub stainless-steel sink with standard single-lever faucet. Include energy-efficient wall oven, cooktop, ventilation system, built-in microwave, dishwasher, garbage disposal, and custom lighting. Add new resilient flooring. Finish with painted walls, trim, and ceiling. Specifically In the Dallas or Fort Worth market if your home is between 2300 sq ft and 3600 sq ft and was built between 1984-2000 the case study above probably best describes the kitchen you currently own. The remodeling climate today is built on upgraded replacements and can entertain many variables, the above *cost is to insure you have a reliable baseline in place to begin your journey. With the above information and armed with a small collection of kitchen photos you now have A COMPLETE GUIDE TO KITCHEN REMODELING. Next Next post: Kitchen Ordeal or Smashing Design… Shots of Trending Kitchen design.